NASA Mars Reconnaissance Orbiter's HiRISE image of Recurring Slope Lineae in Melas Chasma, Valles Marineris. Arrows point out tops and bottoms of a few lineae. However, exploring RSL sites further is a matter of some controversy. One contentious issue has to do with "planetary protection" — how best to safely survey RSL sites up close, without contaminating these features with Earth-transported microbes. Red light on the Red Planet? After decades of speculation, scientists now know for sure that liquid salty water flows on the surface of Mars. See the discovery explained in our full infographic. If there's a way to sample an RSL site with a Mars robot — say, NASA's car-size Curiosity rover— many scientists would be eager to go for it. Life exists everywhere there's liquid water here on Earth, so RSL areas are intriguing places to search for signs of Mars life. NASA's Curiosity rover is currently exploring the base of Mount Sharp. 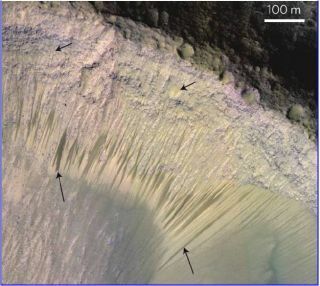 The Martian peak's base has features similar to Recurring Slope Lineae (RSL), which are caused by liquid water, but none are confirmed to be RSL. Sites 33, 36, 46, and 56 are closest to the rover. But other researchers might want to put the brakes on such an operation, out of concern that Earth life could take root at these sites. That worry is especially applicable to Curiosity, which carries contaminated drill bits. Curiosity is currently exploring the foothills of the 3.4-mile-high (5.5 kilometers) Mount Sharp, which lies in the center of a big crater called Gale. The powerful High Resolution Imaging Science Experiment (HiRISE) camera system aboard NASA's Mars Reconnaissance Orbiter has spotted streaks near Mount Sharp's base that have characteristics similar to RSL. However, none of those markings has been confirmed to be RSL as of yet. "The bottom line is that there are no promising candidates near Curiosity, so diverting the rover to look at poor candidates may not be justified," said HiRISE principal investigator Alfred McEwen, of the University of Arizona in Tucson. However, "If they [mission scientists] do get in range [of an RSL site], they should image over a range of [different] times of day," McEwen told Space.com. David Stillman, a scientist at the Southwest Research Institute in Boulder, Colorado, voiced similar sentiments. "Round-the-clock monitoring of a dark RSL is just what we need," he told Space.com. "It would be wonderful if Curiosity could sit below an RSL alcove and watch the incremental lengthening." Stillman contends that RSL are the most accessible form of water on Mars — easier to get at than buried ice and hydrated minerals. Therefore, astronauts should take advantage of RSL features"and use them as early settlers used spring water," he said. Curiosity is not permitted to access "special regions" on Mars — areas where liquid water exists, or where Curiosity's presence could cause liquid water to exist (say, by melting ice) — said Cassie Conley, NASA's Planetary Protection Officer. "So the question in regard to RSL access by Curiosity would be how far away the rover needs to stay," Conley told Space.com. "Guidelines on 'how close is close enough' are certainly in work. We're in the process of setting up detailed analyses to evaluate where Curiosity may go relative to dark slope streaks/RSL in Gale Crater." Shaping those guidelines depends on many factors that are currently poorly known, Conley said, so her office will be having a detailed discussion with Curiosity team members to understand all available current data about the specific locations and traverses in question before coming to any conclusions. "These will be analogous in general to the proposed constraints on future human missions," Conley said, "which involve estimation of the amount and type of Earth contamination that could be released, and also consideration of possible transport mechanisms that might introduce contamination to special regions." Look, but don't touch? NASA's Curiosity rover is on the prowl in an area that may harbor features called Recurring Slope Lineae (RSL), which are caused by liquid water. John Rummel, a senior scientist at the SETI (Search for Extraterrestrial Intelligence) Institute in Mountain View, California and a former NASA Planetary Protection Officer, has his own bottom line when it comes to Curiosity and RSL sites. "Curiosity has nothing much that it can add to the picture with any of its stand-off capabilities, and quite a lot to lose in trying," Rummel told Space.com. From 65 feet (20 meters) away, "the rover can tell us pretty much the same things that we can already tell from orbit," Rummel said. "What is the benefit from taking the risk?" Furthermore, RSL sites may consist of a crusty layer atop soupy brine, akin to a crème brûlée dessert, Rummel said. So exploring an RSL-harboring slope could be hazardous in multiple ways. "That could give way and trap the rover or flip it over, downslope," Rummel said. "And for planetary protection purposes, the potential to break it open has got to be considered as well." If such an incident did occur, the debate about ultraviolet sterilization of Curiosity's exterior would be moot, Rummel said, because the "unaccounted" microbes on the machine's inside could come into contact with liquid water. "So if making a so-so measurement of an RSL kills both the rover and our chance to explore Mars responsibly, I can't get too enthusiastic about the bet!" Rummel said. "But if someone wanted to make that bet, they would have to demonstrate, through modeling and experimentation, that there would be no threat of letting live Earth microbes into the potential special region at whatever distance they pick." Furthermore, NASA's Planetary Protection Officer, along with the head of the space agency's Science Mission Directorate, "would have to agree with that decision," Rummel concluded, "something I think extremely unlikely with what we know today."